The scene at the crash last night. 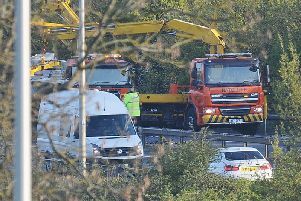 A fifth person has died in three months on the same stretch of road, prompting renewed calls for safety improvements to be made. Off-duty police officer PC Max Walsh, who was based at Thorpe Wood police station in Peterborough, was killed when his Ford Focus was in collision with a Scania lorry on the A605 near Elton at about 12.37am on Friday morning. PC Walsh (52) joined the force in June 2003 and had latterly been working in the volume crime team. His wife Tina is also a serving officer with the force and based in Peterborough. She is being supported by immediate friends and family. Following the latest casualty on the road Richard Donoyou, vice chairman of Elton Parish Council, said Cambridgeshire County Council has pledged to make safety improvements on the A605. He said: “We are massively concerned about the safety of the road. “We have been lobbying the county council very hard for a number of years and it very recently came back to us to say they are to put some improvements to the junction of Overend and the A605. “We are massively pleased about that but we remain very concerned with the speeds on the road. It’s a 60mph limit. North West Cambridgeshire MP Shailesh Vara said after the previous death on the road in June that he would be writing to the county council and Department for Transport (DFT) to see how accidents could be avoided there in the future. A Cambridgeshire County Council spokesman said: “The county council is committed to reducing road casualties and we are working actively with our partners including the parish council, local members and police to look at any action that can be taken following this sad incident. A DfT spokesperson said: “Britain has some of the safest roads in the world but we are determined to do more because every death is a tragedy.